Then this morning while blog surfing I saw that JAI's challenge was just add blue for Anxiety and Depression Awareness Month and it also happens to be Mental Health week this week. I've previously mention on my blog that I suffer from depression so when I saw that JAI was holding this challenge I just had to create something! This card is fabulous! I love how you have used that beautiful paper doily as a feature and coloured it to blend in with the rest of your card. Thanks for playing at JAI. I love this card! I too love the way you put ink to your doilie - great to see something a little different. Never heard of Simple Treasures, heading over for a look now, tfs. 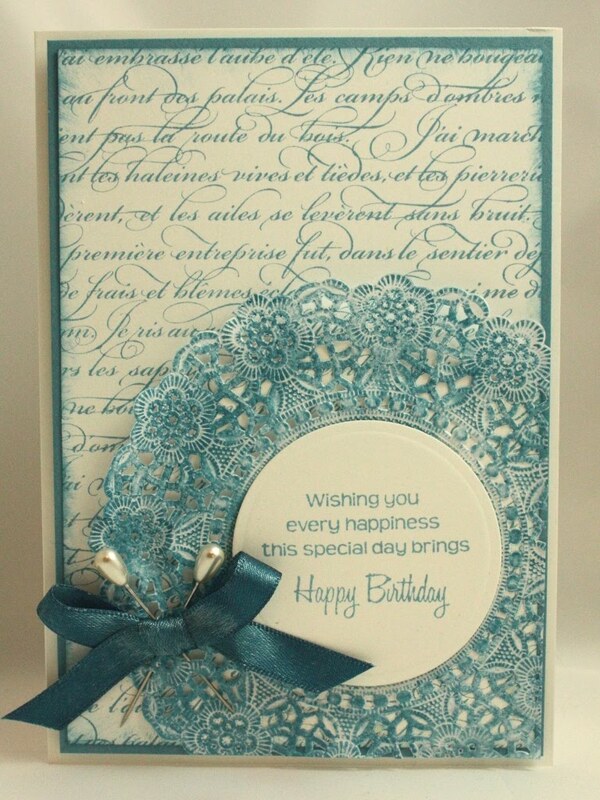 wow, this card is terrific, I love the doily coloured with ink, its great, and love the background stamp too, lovely card! 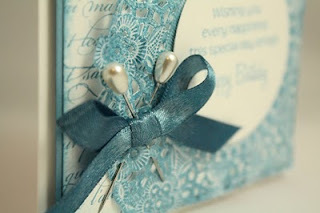 This is a really beautiful card, I love all of the elements you have used! Oh wow! This is definitely jaw dropping inspiration. LOVE that doily. Oh, this is BEAUTIFUL, Trish!! The doily goes so well with En Francais, and I love how the sentiment fits in the centre. Gorgeous! HOLY COW TRISHIE!! This lovey, is a total work of art! Houston, I think we have a top pick!!! LOVE IT!! This is so beautiful. Love the doily. Wow! This is so gorgeous! Thanks for playing at Just Add Ink and supporting Anxiety and Depression Awareness Month. This is just the most STUNNING card! LOVE the script and the doily. Thanks for sharing! I think this challenge has touched a lot of us! Just beautiful Trish. 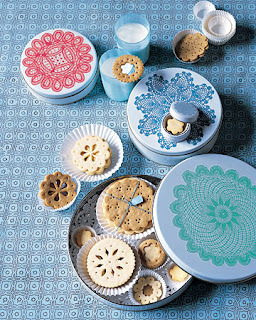 Love the paper doily - at first I thought it was a stamp.